Annyeong hasayeo to everyone out there and welcome to another edition of Mastication Monologues! Today’s post is a bit different because it deals with a subject that Korean culture enjoys greatly. No, I’m not talking about K-pop super groups or overly cutesy-wootsy cartoon animals that could cause diabetes with their saccharine antics (although these two elements really do permeate every part of life in Korea). I’m actually talking about drinking alcohol in social settings. However, instead of calling attention to Korean classics like soju and makkeoli, I’m going to shed some light on the craft brewing scene in Seoul. No longer do you have to suffer with the anemic attempts at legitimate beer in the form of a cold Hite or Cass! First, we shall take a jaunt down to Craftworks in Itaewon. Craftworks is located at 651 Itaewon 2-dong, Yongsan-gu, Seoul (http://craftworkstaphouse.com/), but it’s a little hard to find since it’s wedged behind another restaurant in an alley. 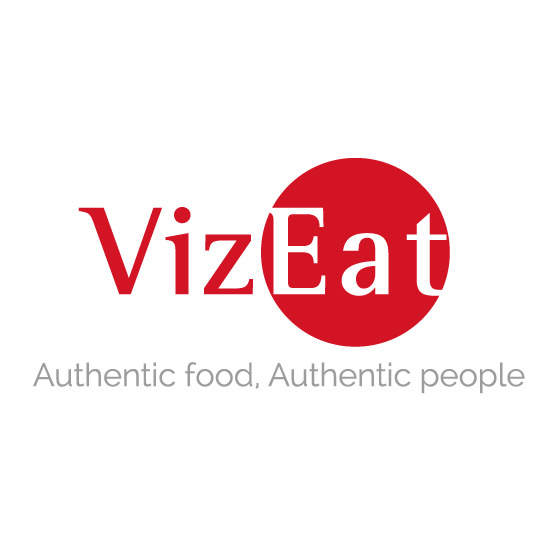 Even though it may sound a bit seedy, in reality it’s a hidden gem of a gastropub. When I first walked in, there was a 40 minute wait, and I could see why. First, there is their beer menu that is filled with homemade craft brews that are named after Korean landmarks and range anywhere from IPAs to Weisbeers to Dark Ales. Then there are their menu offerings which include barbecue, wings, build your own salad, sandwiches, and some desserts that made me think of home when I was waiting for a table. There in front of me in the entryway was a glass case which contained a lattice topped peach pie that was as big as a hubcap and right beside it, a decadent red velvet cake. I must have died and went to the American enclave of heaven. It was a definite contrast to the Korean dried seafood and rice cake bonanza that was being displayed in the metro station during my commute to Craftworks. Eventually, my friend Nate showed up, and we got a table. 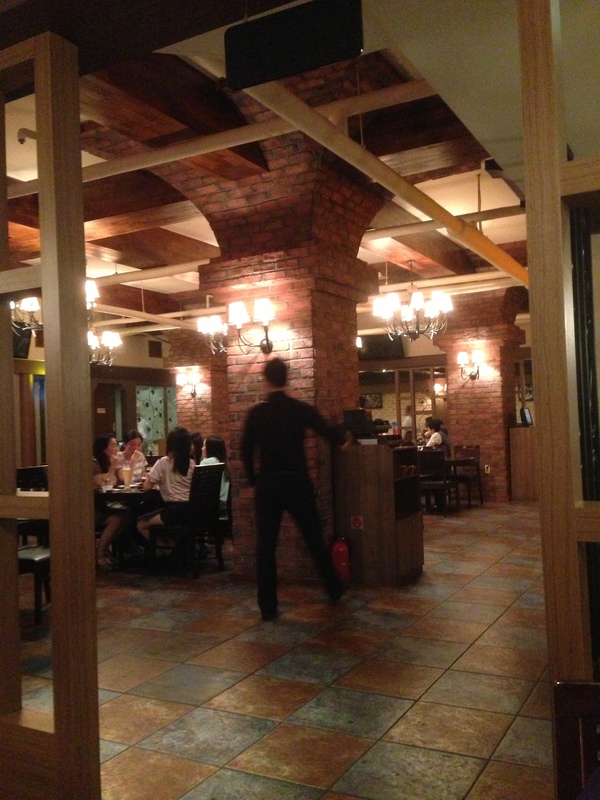 The interior was very classy with a dark-wood bar and large glass windows that opened up to a mini patio. Definitely the perfect ambiance for enjoying a hand-crafted beer on a cool night. I started off with the Jirisan Moon Bear I.P.A (7,500 W). The name is interesting since Jirisan is a region in southern South Korea and has one of the three most important mountains in the country. As for the Moon Bear, it’s a reference to the the Asiatic black bear whose bile is (controversially) consumed for traditional medicine to cure a variety of ailments. Animal cruelty aside, the beer itself was quite surprising since I’m not the biggest IPA fan, and don’t worry, there wasn’t any bear bile in it. 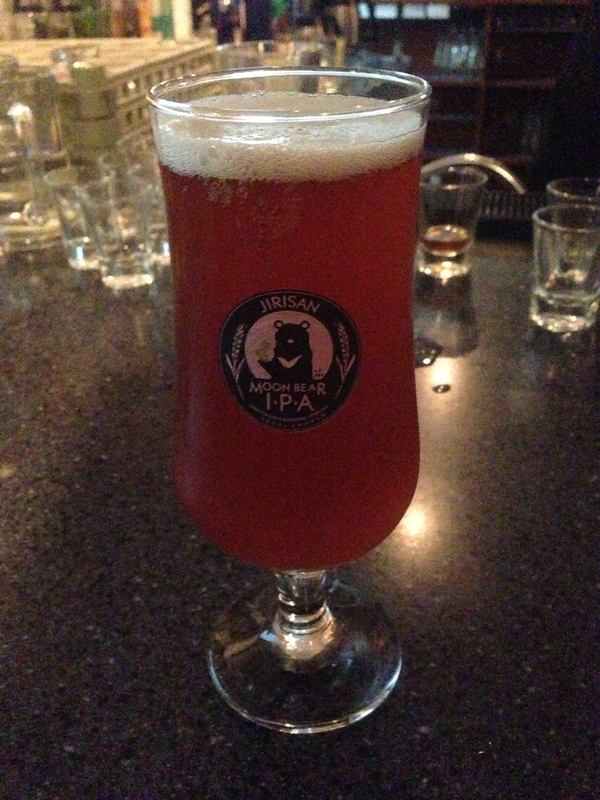 It had clear citrus notes throughout the body, and the aftertaste did not possess an overwhelming hoppiness. I then moved on to my soft spot: dark beers. 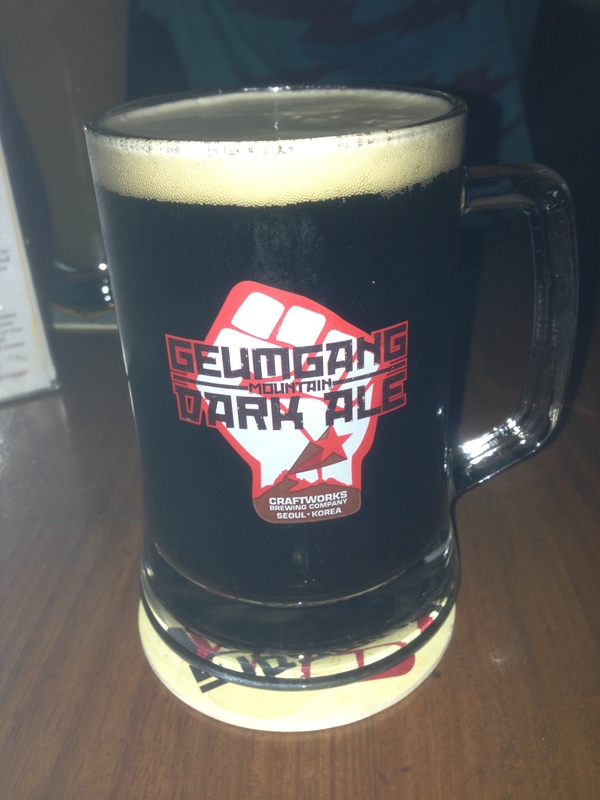 I went for the Geumgang Mountain Dark Ale (6,000 W) which checked every box which I look for in a quality beer. It was darker than a black hole, and the flavor was relatively free of hops. Plus, there was a slight smokiness to the aftertaste along with chocolate undertones. Once we had our fill in the wonderful ambiance of Craftworks, we made our way over to Oktoberfest in Hongdae. Oktoberfest is an all German affair located at 162-6 Donggyo-dong, Mapo-gu (마포구 동교동162-6); +82 (2) 323 8081. Their beer selection isn’t as wide or as creatively named as the libations at Craftworks, but they serve some German classics like Pilsner , Weissbier, and even a half beer, half Sprite Radler in sizes from small (300 ml) to large (1,000 ml). 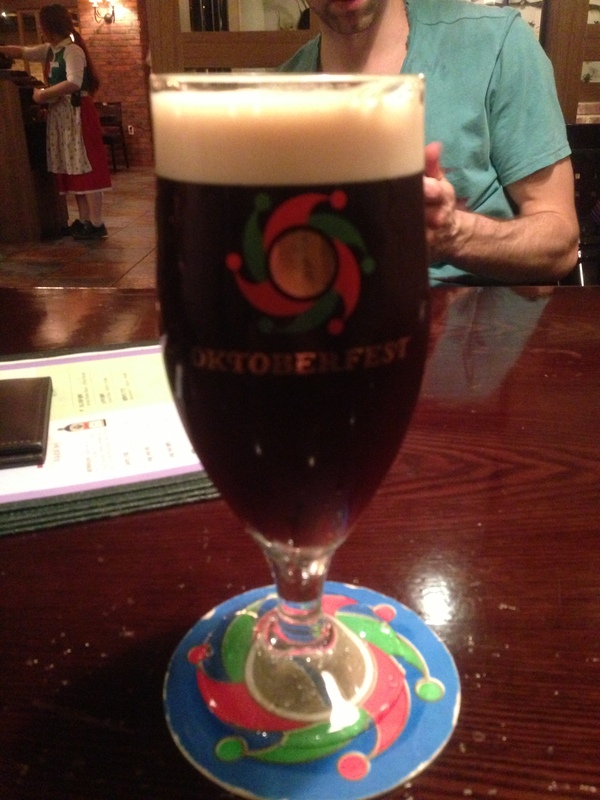 However, I went with a small glass of Dunklesbier or dark beer (5,000 W). It was not as fierce as the Geumgang Dark Ale, but it was very smooth with a malty aftertaste. It also lacked the distinctive smokiness of the Dark Ale. Next time I think I will try the Radler since it is rarely seen outside of Germany, and I do love my Sprite. So there you have it, folks. There are many other craft beer breweries in Seoul that I still have to visit, but I hope this entry has shed a little light on the beer scene in Korea and provided a glimmer of hope for those who want to move beyond weak, fizzy beer. Posted in Alcoholic, Beer, Beverages and tagged Bar, Beer, Beverages, German, IPA, Korea, restaurant, Reviews. Bookmark the permalink.